Emmett Russell pulls on his worn gloves and slides clear plastic safety glasses over his eyes before picking out a sheet of metal and plugging in the welder. 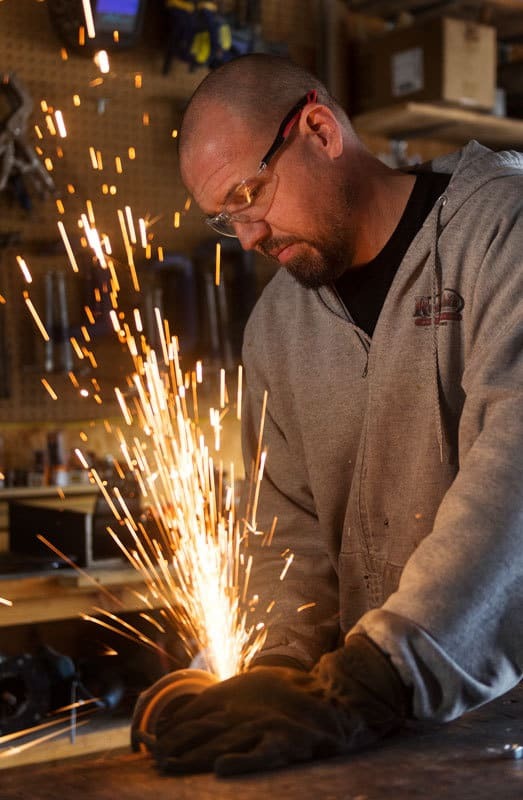 His gray “Russellbilt” sweatshirt keeps him warm as he works in the coolness of his garage. A process of flying sparks, measuring, and trial and error begins with a large sheet of metal and ends with industrial-style handles that he will sell for around $10. Russell has made a living working with his hands since he was 19. From welding trailers to building motor homes and finally following his passion and creating artwork like the expressive graffiti on his garage door, his life has changed dramatically along with his career. Russell’s two children, Emma and Ethan, have juvenile nephronophthisis, a genetic kidney disease. Ethan, 15, was also born with autism and has already had two kidney transplants. Emma, 17, has had one kidney transplant. Russell and his family moved from a small town in Iowa to Columbia in 2009 for the autism resources at the Thompson Center and grade school systems. “We came to Columbia with no jobs, not knowing anyone,” Russell says. After moving to Columbia, Russell started a home improvement business. “I put ads on Craigslist. I knocked on doors. I just did whatever I could,” he says. Russell’s path to Russellbilt, his custom-made art and furniture business, was not a straight one. He tried college, but it didn’t take. He dabbled in motorhome construction, welding and making food-grade steel items before launching the home improvement business, which then led to his current vocation. Russellbilt also allows him to spend more time at home, in case Ethan has a bad day. “I think moving to Columbia was the best thing I’ve ever done,” Russell says. “With everything we have going on with the kids and trying to build a business, I can’t even imagine that happening back home.” Ethan visits the Thompson Center for therapy for autism, but his kidney problems are their main focus, Russell says. “It gets harder as they get older,” referencing the level of care that Ethan needs. But Russell’s desire to own his own art business is a result of more than the necessity of being close to the kids. He first dreamed of working out of his garage and creating art when he was 25, but did not think it was possible at the time. “It’s been in the last three to four years that I began to see my dream as a possibility, and also as a necessity,” he says. Ethan will always need some care. Russellbilt allows Russell to support both kids not only financially, but physically. He made the commitment to switch solely to custom-made art work and furniture about five months ago. The table tops, barn doors, bar and liquor ladder at the Barred Owl were Russell’s first big Columbia project. “I consider the Barred Owl project my breakout project — it was the first one I could pour my heart and soul into and show my work to people,” he says. Ben Parks, one of the owners of Barred Owl Butcher, connected with Russell through their interior designer. “We talked through what we were looking for and I had seen some of his work and we thought it was going to be a good fit,” Parks says. Russell made samples of handles and brackets for Barred Owl, and they knew it was the right choice. “We liked the direction he was going in so we set him loose on this,” Parks says. Since the Barred Owl project, Russell has built custom furniture and artwork for My House Nightclub & Sports Bar, Fretboard Coffee, Good Food Co. and Trove Salon. Russell also builds art for private homes. 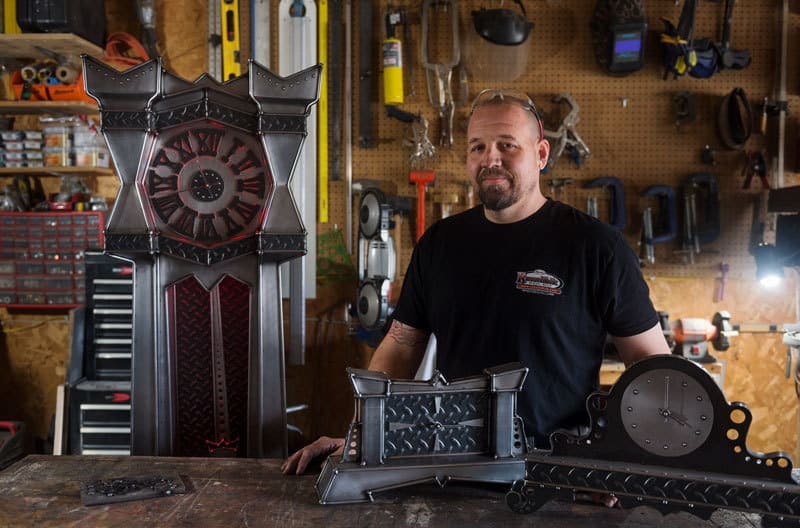 He recently finished a grandfather clock for podcast author Brendan Schaub. With each project, Russell spends time imagining the project and sketching it out before he begins working with metal. Like father, like daughter. The intersection between creativity and organization is an integral part of who both Russell and Emma are. Emma has her dad’s artistic drive. She has a business, Beary Slimey Shoppe, where she makes and sells “slime” on websites like Instagram and Etsy. “It’s so great to see her create, and we have always been supportive of that,” Russell says. Like her father’s garage, the shelves in Emma’s room are stacked to the ceiling with the supplies she needs when inspiration strikes. Back in his shop, Russell holds up the metal handle he just created, inspects it and decides it’s still not quite perfect. He turns the welder back on and pulls his helmet back over his face, and the sparks of creativity keep flying.